The practical applications of location data are almost endless in the modern interconnected world. GlaxoSmithKline (GSK) wanted to anticipate flu outbreaks in Indonesia to create targeted advertising campaigns for relevant vitamin supplements. To do this, consumer behaviour predictions agency Black Swan used geospatial data derived from social media, such as people complaining of cold and flu online. The agency used this with local weather data, and GSK and government historic prescription information to build a geospatial data model, supported by artificial intelligence, that could accurately predict cold and flu outbreaks across the country four to five days before they became known to local authorities. According to Steve King, chief executive at Black Swan, deciphering location data from social media was important, but challenging, as it often had to be “enriched with locational clues and mined harder to understand the geographic elements that were not baked in”. When fully functional, the algorithm was linked to marketing servers, so that when an outbreak was anticipated in a particular town, localised adverts promoting relevant vitamin supplements were purchased on mass to encourage people to stock up. The model, which cost around £80,000 to build, was later provided free to the NHS to predict cold and flu outbreaks to improve management of A&E waiting times. Global deforestation reached a record 29.7 million hectares in 2016, according to data from the University of Maryland. The UK Space Agency-funded, £14-million Forest 2020 initiative, being developed by Ecometrica, aims to tackle this problem by using geospatial data to monitor 300 million hectares of tropical forests in Indonesia, Brazil, Colombia, Mexico, Ghana and Kenya for illegal mining, logging and fires. 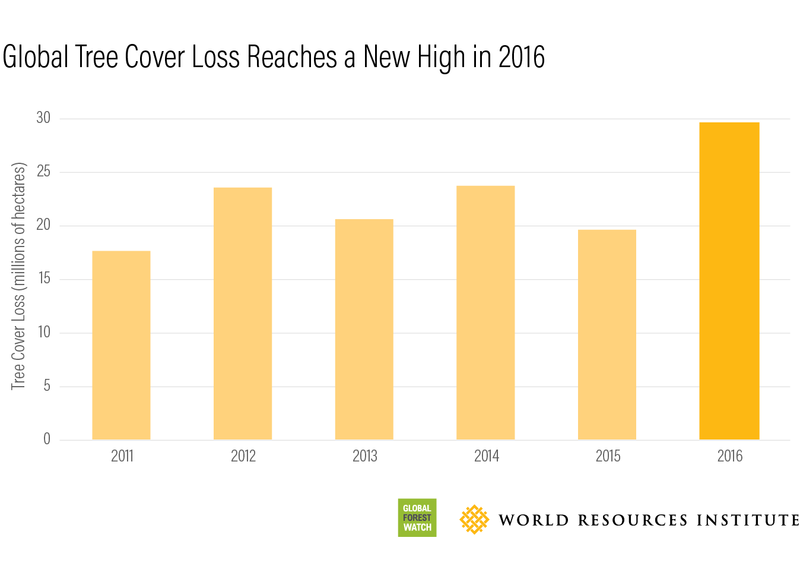 29.7 million hectares of forest were lost in 2016. The company harnesses remote georeferenced data from satellites, including the European Space Agency’s Sentinel satellites, drones, corporate area networks and social media, which is then analysed in real time using machine-learning and artificial intelligence, and sent to the web browsers of relevant agencies in the partner countries. The bi-weekly refreshed data creates an up-to-date picture of what is happening on the ground to reduce response times from weeks to days, compared with traditional methods of surveying land with helicopters. The model could soon be used to monitor natural disaster risk and response, says Gary Davis, chief executive of Ecometrica. “This creates opportunities for everyone to use geospatial data, regardless of their expertise,” he says. In the insurance sector, detailed data creates better predictions and more accurate customer quotes. Yet potential purchasers often don’t know the information needed for rigorous risk assessments, such as the distance of their house from water. Furthermore, lengthy and burdensome questionnaires can lose firms business; analysis from HubSpot found, by reducing form fields, customer conversions improve. PCA Predict uses its Location Intelligence platform to compile free data from the Land Registry and Ordinance Survey, including LiDAR height maps, as well as commercial address data, to determine accurate information on a potential customer’s property, such as distance from a river network, height, footprint, if the property is listed and its risk of wind damage. The model is also being developed to determine a building’s age using machine-learning and road layout. “We take disparate datasets and apply different types of analysis to extract easy-to-use attributes for insurers,” says Dr Ian Hopkinson, senior data scientist at GBG, the parent company of PCA. The data can be used to pre-fill application forms automatically, based on address data, or to enable firms to provide a no-questions-asked quote. The internet is made up of data flowing around various global networks all stitched together in cyberspace. To give a visual representation of how these networks sit together globally, cloud-hosting company Cogeco Peer 1, in collaboration with CAIDA, an internet monitoring group, has created a map of the internet using geospatial data and technology. The open-source app allows businesses and educational organisations to perform trace routes to see how many connections a node has and where they themselves sit in cyberspace compared with the networks they want to connect to. Understanding how data hops across networks from one point to another is important as fewer hops means less transitions between networks and improved speed of data transfer. To improve visualisation of the data, the app also has a virtual reality function. According to the International Longevity Centre, the UK death rate is set to increase significantly over the next 20 years due to the increasing proportion of the population over 65. But, due to fierce competition for land use in the UK, new crematoriums are often built where there is cheap access to land, rather than where they are most needed. Carter Jonas, on behalf of Horizon Crematorium, used spatial analysis to breakdown Office for National Statistics and Census geography data to determine a spatial distribution of deaths in specific areas. Using this data, the company created what it calls a “death surface 500m by 500m grid” across the UK and used spatial analytics to determine optimal catchment areas for new crematoriums. To find competitively priced land in a high-demand market, the company used constraint geomapping. Based on this data, it is now building one crematorium and seeking permission for five others. “We showed it is possible to adapt data collected at one scale for use at another, allowing a national need to be shaped by local commercial and political geography,” says Andy Williams, partner and head of geospatial at Carter Jonas. This article was published in collaboration with Raconteur.